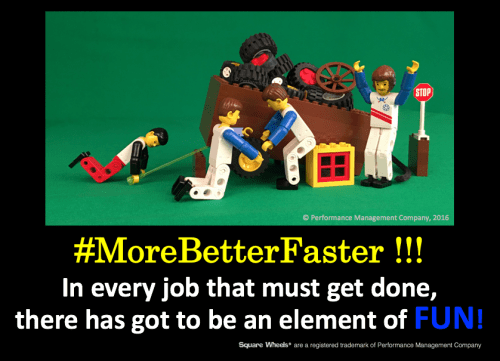 It took me about two seconds to come up with the title for this post, after looking at a number of different posts around ideas for engagement and ideas for improving performance this morning. I put up a couple of things on my scoop.it page on Employee Engagement and I was completing a chapter for a book, so some thinking around the issue was fresh. There is a lot of writing around what to do and how well things are working. Generally, the information provided by Gallup and Sirota and others suggests that little is actually improving. It begs the question, why not. My belief is simple: there is not enough effective communications going on between the supervisor and the workers. There is not enough alignment to visions and goals and expectations, not enough or sufficient performance feedback (and I do not mean coaching here — see this analysis) and there is not nearly enough listening or asking questions by the management team. • Is it task interference? Do the supervisors simply have too little time to devote to listening about issues and opportunities? • Is it an actual lack of employee interest in what is going on in their workplace? • Is it the reality of measurement, and that workers just do not have the scheduled time available to them to be in meetings with their boss? • Is it somehow related to the overall training and development goals of the organization, in that these meetings should be produced and directed by the people in Training and Development or HR and that developmental and coaching discussions with people are not the role of the managers? • Is it a disconnect between the manager and the supervisor when it comes to themes of productivity and employee retention and performance levels? I am not really sure, but I do know that the opportunity for improvement absolutely exists and that it IS relatively easy to involve and engage people and get their ideas about workplace improvement and job performance skills and techniques. And I know that we can improve real teamwork and collaboration with this same approach. Is this really so HARD to accomplish? Aren’t you pretty sure that people have ideas for improvement and will share those ideas in a meeting and discussion? Sure, if the workplace has a poor history of engagement and innovation (“bad managers” abound, the research suggests), you should expect some initial venting of frustration. But most people DO have positive intentions and DO want to have a positive impact on things. They get intrinsic motivation from doing things successfully. Implementing Round Wheels in a Square Wheels World is not all that difficult to accomplish. If you don’t believe it, go ask somebody! And if you are looking for a simple tool to better involve and engage, we just uploaded the new “Stupidly Simple Square Wheels Toolkit” on our website – $25 with instructions and tools.